Delicie-se com a grande arte de comer tapas - pequenos pratos no estilo espanhol - e vivencie Barcelona como um habitante. Passe 3 horas com um guia experiente que leva você até animados bares de tapas e bodegas em bairros como El Raval e Poble Sec. Quatro taças de vinho ou aperitivo estão incluídas em seus tapas. Ao final da excursão, você saberá distinguir a suas "banderillas" de seu "pintxo", mesmo se você não consiga pronunciar! Limitado a 12 pessoas para garantir uma experiência de excursão em grupo pequeno. Great way to begin our stay in Bacelona, with Eddie as the guide. Small group of four people with an opportunity to sample tapas and drinks at small, local establishments. We learned about both the area and the tapas themselves in a relaxing way. It was fun to get away from the tourist area. The vermouth was a nice surprise and we have since purchased some to take home. Only disappointment was that we never received the follow up email with the names of the places we went and copies of the photos that were taken. Alicia led us to 4 very different local venues for Tapas and drinks. Each location had excellent food which was appropriately paired with drinks. Alicia was a great hostess and we enjoyed her conversation and insights on Barcelona. Worth a return visit. very enjoyable walking tour to 4 local tpas places, one of which was one of the oldest bars in Barcelona. Awsome experience fun restaurants and good food. Alicia was absolutely wonderful. We visited 4 different tapas bars and each was unique in its own way. We tried a variety of foods and drinks. She was informative and pleasant. Highly recommend this tour if you want to be a local for the evening, away from the tourist traps. 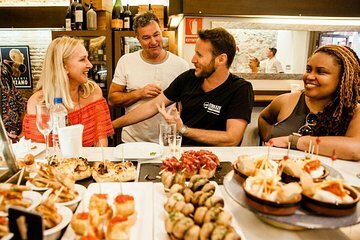 Great way to get to know the local tapas scene, trying places off the tourist map. The food was good and plentiful we couldn't eat any more, as was the drinks we tried. The guide was informative and it was a very pleasant evening.